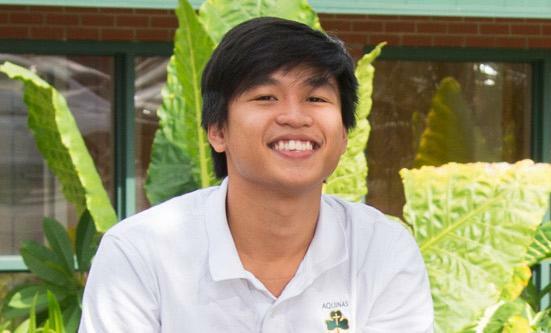 Senior, Jackson Vu, shares about overcoming difficulties to succeed in his studies in America. At 11 PM, all I can hear are the frogs and insects chirping outside my suburban house. In front of me is the pile of homework that is due tomorrow. I wonder how long the night is going to be. This has been a typical day for me ever since I came to America last year. With all the stress and depression, studying in America has been the greatest hardship I have ever faced, but through that I have learned the most important lesson of my life, to never stop believing in myself. Because English is my second language, I was completely overwhelmed on my first day of school. In class, despite my efforts to stay focused, I was unable to comprehend anything the teacher said due to my lack of basic English skills in listening and writing. For homework, most students can read and answer a question in only about 5-10 minutes, but I would find it surprisingly hard and would need at least 30-40 minutes for the same question. Acknowledging that I need to study a lot for every quiz and test, every day after school, I would immediately go home to start studying. I would often stay up even past midnight just to finish the homework, but it did not save me from failing my first tests and quizzes. On my first report card, I had Bs and Cs in most of my subject. When I took the PSAT, I got a below average score. I soon acknowledged that there was a big gap in knowledge between my peers and me. I was frustrated and did not know what to do. Basketball plays an important role in overcoming my hardships. My coach teaches me to never give up. Every day after running two miles up the hill, we come back to the gym and use the remaining energy to try to stay alive through the workout. Although we are all sore and hurt, Coach reminds us that we can do anything as long as we believe in ourselves; it all depends on whether we want to achieve your goal or not. As I developed this work ethic of not giving up in basketball, I realized I should also apply it to my studies; as a result, I would not go to sleep until I finished all my homework. During these days, my parents have been very supportive of me. Since they want their child to have a bright future, they highly value studying, but they do not judge me on only my grades. Instead, they create a comfortable atmosphere for me to talk to them, and they cheer me up when I tell them about the struggles that I have while living in America. Although we live a world away, I never feel that distance is a barrier between my parents and me. They have worked so hard to support my sister and me to continue our studies, so they have become my motivation to keep trying hard to overcome my problems at school. With that in mind, I spend endless hours after school and weekends studying. My mind is set on one goal: to get my grades up and to speak and understand English fluently. I want my parents to be proud of me, and I want all their hard work and support to pay off. Gradually, my scores improved, and I ended up my junior year with good overall scores. In conjunction with that, I used most of my summer to prepare for the SAT and read as many books as I could to improve my English. By the start of my senior year, my SAT had significantly increased, and I was able to perform basic English skills like an American student. This, by far, has been the greatest achievement I have ever accomplished. Through this experience, I learned a valuable lesson. I can overcome anything in life as long as I believe in myself. This experience has taught me to never give up, to never stop working hard and to believe in myself. Also, I learned how important a role family and sport have played during my hardship. As we usually pray before basketball practice as a team, “Today is a good day. I waste it or use it for good. I exchange a day in my life for it. I want to be good, not bad, strong not weak, a success not a failure in order, that I will never forget the price that I pay for it.” This experience has helped me grow and sharpened me to become the person I am today. For that, I do not regret any decisions I have made, and I hope that this is the way that I will overcome any challenges in the future.